My jumping off point for this recipe is the White “Chocolate” Candy recipe from Comfy Tummy. I also bought coconut butter in hopes of using it like cocoa butter (which I can’t find and didn’t want to special order). It works pretty well. It doesn’t have a white chocolate taste, but it’s own flavor is good (subtle coconut and whatever falvoring is added), and the texture is like chocolate. When I started making it I realized I had poured a little too much honey into my pot, so I had to play around with the quantities a bit. I wanted to try making peanut butter cups, and then I thought nut clusters sounded pretty good too. 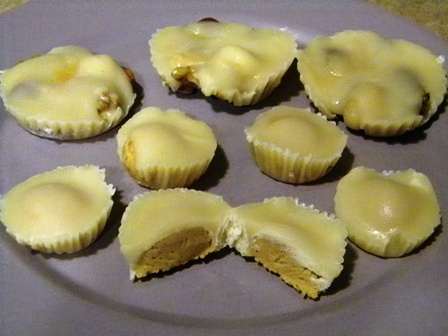 For the peanut butter cups, spoon a small ball of peanut butter into the mini-baking cup. For the nut cluster put several nuts (5 – 6 depending on size) in the bottom of the baking cups. Combine all ingredients (except peanut butter and nuts) in a small saucepan. 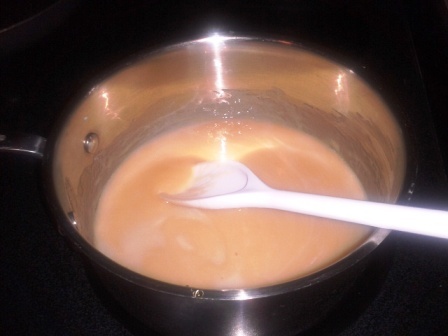 Stir constantly over medium heat until coconut butter and regular butter are melted. Stir until well combined. This only takes about five minutes. For the peanut butter cups I lined a mini-muffin pan, and for the nut clusters I used regular size baking cups in my jumbo muffin pan (a regular muffin pan or other small dish would also work). Spoon about a tsp or so of coconut butter mixture over the peanut butter. Pour a little of the mixture over the nuts just so they are covered. Put everything in the freezer for about 20 – 30 minutes. Let them warm up a couple minutes before trying to peel the paper liner off, or it will stick. Store candy in refrigerator. It melts quickly. This made 6 peanut butter cups and 4 nut clusters. Real Food Forager Fat Tuesday.